Clients have been asking for some time for drill rolls. They are around. Both sets of double spiral "Jennings type" and single spiral "Irwin type" bits could be purchased in rolls. And actually, rolls make a lot of sense in a tool box, especially one that travels about. Not only are they less bulky, but they offer some protection to the drills they contain. In later years, these rolls were often made of plastic. They hold up well, but frankly, just look ugly. The old cotton duck and canvas rolls looked nice, but wear out over the years. Of the five rolls I have now, only one could be considered serviceable. Remember, these rolls were owned by tradesmen. They were making a living with their tools and could be rough on them in the process. Craftsmen can take their time. Old tools are becoming rare and good new ones are expensive. A good cloth drill roll makes sense. I've actually made one or two over the last few years, but I'm a wood worker, not a tailor. And trust me, the rolls I made showed this! Also, I just do not have the time or the equipment to learn how to produce rolls in any numbers. The plot thickens here however! A client in Virginia asked for dimensions on the old rolls I have laying around. His wife sews, but needs to know what he needs specifically. The wheels started turning! Why not offer plans for drill rolls anyone could download? They could then find a way to make their own rolls. Initially my plan was to dimension each roll, then render mechanical drawings of them. But first I wanted to help that customer in Virginia. 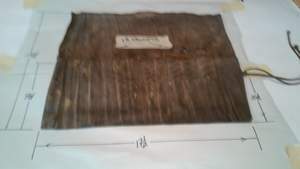 I came up with the idea of laying an old roll on my bench under blank paper. Now I could simply use a yard stick and Sharpie to put dimension lines around the roll. Needless to say, the seamstress who takes one one of these projects is probably going to need an intermediate level of experience. Margins for hems, serge stitching and so on are going to have to be factored in. But I've done everything I can do to making it possible to create workable replicas of these old rolls. So be courageous and pull out Mama's old Singer.....Or buy her roses and do the dishes for a week so she can have the time, and you might just end up with a decent way to store your bits! Of the five rolls I have at this time, the "Irwin roll" is the only one with a logo, and therefore traceable, obviously, a carrier for single spiral Irwin bits. It also happens to be the most complex. It is also probably the most protective, and I would guess as attractive if made by a good seamstress/tailor. All the rolls will require some very straight stitching to create the pockets, but this roll will require some sort of surging as well. NOTE: When I mention the words "up/down, or left/right", I am referring to the roll laid out upright with the inside facing up. This shows the outside shell of the 'Irwin roll"
This is the logo stenciled on the outside of the flap. 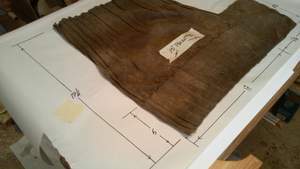 Note that the roll is made in two sections; first the main body, then an off centered flap attached just in from the right, at the top. Finished base 16 1/2 in. There are two layers to this piece. The outer shell is duck while the inside is flannel. The edge is corded, but this is obviously done last, in order to cover the bottoms of the pockets. All four corners of the main body are rounded. The outer shell extends up the base of the flap by 3 in. to strengthen the fold. Finished height 4 1/2 in. 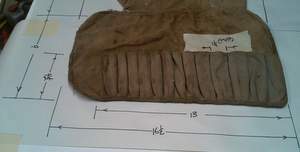 There are thirteen (13) pockets located on the lower right corner of the main body. These are made from a single strip of duck that is first hemmed on the upper and left edges only. 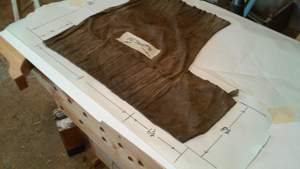 The lower end of the pockets are tucked together, attached to the lower portion of the main body, then corded over as is the far right pocket. Each pocket is about 1 in wide, but uses about 1 1/4 in. of duck. This gives you abot a 3 to 3 1/2 in space on the left side of the main body. 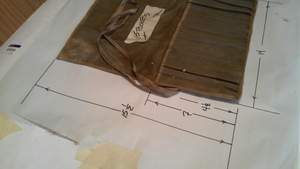 This shows the overall dimensions of the main body and drill pockets. FINISHED WIDTH: 13 in. 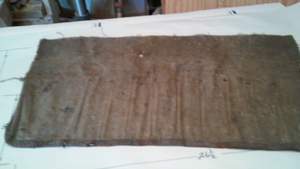 inset from the top of the main body by ABOUT 1 1/2 in. 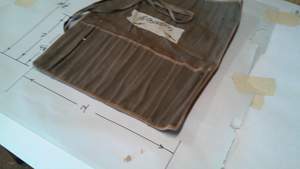 NOTE: The 1/2 in difference between the flap and main body is probably to allow the flap to drape neatly over the drill pockets. As noted before, the outer duck shell comes up the base of the roll for about 3 in. This obviously protects the roll from the points of the augers when everything is in its place. This upper seam is surged to the flannel backing. The rest of the flap is actually an extension of the flannel lining. 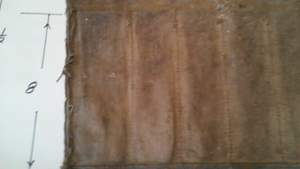 This is a view from the top of the flap showing that it is inset about 1 1/2 in. from the right and about 3 in. from the left. REMEMBER..This is a decades old roll that has been stretched quite a bit. Just play around and make the dimensions work for you. Here's an overall view of the roll that gives MOST of the dimensions. Trust me! The flap is 9 1/2 in.! 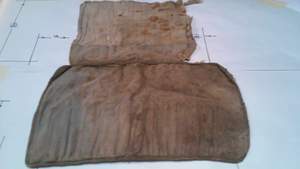 Even thought the main body was corded, the flap side and top edges simply received surging stitches. This old roll is an old trooper who has obviously carried bits for many years. Its design is simple, similar to the Pretty roll, in fact even more basic than that. The stitching seems more basic and it would probably be an easier project to complete. By the look of the tie string, this roll has been repaired a number of times during its service. Like the Pretty roll, there is only one section to this roll. The upper half simply folds down over the drill pockets prior to rolling it up. 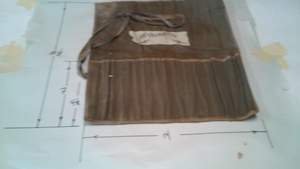 The drill pockets are simply sewn into the bottom half and, what appears to be a shoe string is tied on the left side as a tie string. Finished base 17 1/2 in. This gives you an idea of how the Journeyman roll is put together. Finished length 17 1/2 in. Finished height 7 1/2 in. 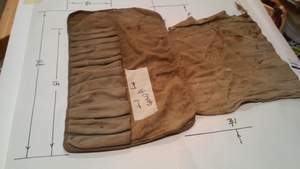 There are thirteen (13) pockets located on the bottom of the main body. 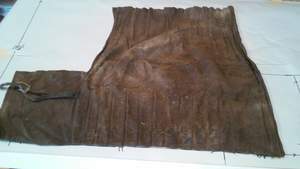 These are made from a single strip of duck that is first hemmed along the top, then sewn into the bottom of the main body along with the final hem there. Here again, it is difficult to say whether bunching was done to allow for the drills or the fabric simply stretched over time. My guess is the latter. This gives you a better idea of how the drill pockets go in. The tie string on this roll is quite interesting. It appears to be a heavy boot lace that was looped through a punched out hole and knotted 5 1/2 in. up from the bottom on the right edge. If you were to try this roll, you might want to consider putting in a small grommet here.....and maybe a leather boot lace to give the roll a little charactor! Here is an good view of how the tie string goes together. That's it! No surging, special lining or logo's, just a plain and simple roll that anyone could make and would probably last forever! I call this the "Pretty" Roll only because this particular specimen is still in pretty good condition and could actually be used. Its a simple roll to make, and I've actually done a couple for customers. It features fifteen pockets, which is an advantage as it can store a couple bits more than a full set, yet it rolls out to a fairly compact size. 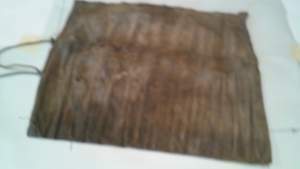 This shows the outside shell of the Pretty roll. *I made one from a cloth drop cloth I picked up at Home Depot. The material was quite inexpensive and seemed to do the job. Even though the top of this roll folds down over the bottom as a flap, the whole thing is made as one piece. This gives you a good idea of the inside construction of the Pretty roll (Apologies for the poor focus!). This roll is of pretty straight forward design and actually includes nothing more than the main body and pockets. Note that the tie string is simply sewn into the hem/cording on the left side. One more picture just to clarify construction. As mentioned before, there are 15 pockets, allowing two extra for redundant sizes or an expansion bit. The finished hight of the pocket tops to the base of the roll is 7 in. 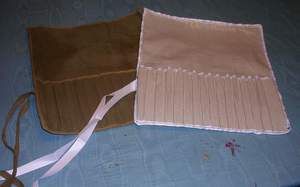 The pockets are formed from one piece of material whose top edge is corded before it is sewn in. There is a very small amount of gapping allowed at the top, but not so much that the bottom has to be tucked in. 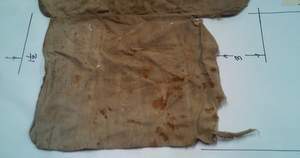 In fact, it is possible the pockets could have been sewn flat and this gapping is just stretching that happened over the years. NOTE: I've wondered if lining this roll with flannel the way the Irwin roll was done would be an advantage. It might make it too bulky, but if not, could offer a bit more protection to the bits. If you wanted to explore this idea, I'd suggest you talk to your seamstress first. This gives you a pretty good idea of how the drill pockets are sewn in. You can simply use a piece of cording as a tie string. 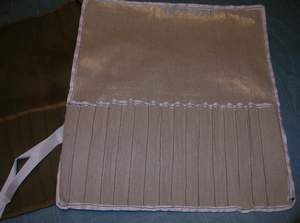 The top picture gives a good outside idea how it is sewn flat to the of the cording about 4 1/2 in. up from the base of the roll. How long should the tie string be? I never actually measured it. I would suggest you make yours purposely longer than necessary then trim both ends to your preference. Why did I call this the "Jelly roll"? Come on, the answer should be obvious!! I couldn't think of what else to call it!! This roll has a relatively complex design only because of the right side flap and tie string sewn into the hem, but the simplicity of its construction would probably make this a fairly do-able project. The side flap is reminiscent of the Irwin roll, but the main body and flap are made of one piece. Also, like the Pretty roll, this piece has fifteen pockets. 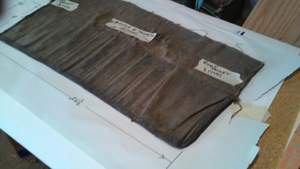 This shows the outside shell of the 'Jelly roll'. 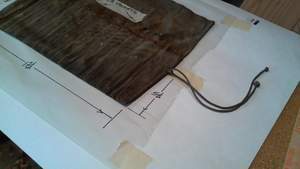 It also shows how the tie string is sewn in. This is really a pretty simple one piece with the addition of a side flap. The flaps are really a pretty good idea when you think about it. Once everything is put into place, they keep the auger bits from 'leaking' out of the end. There is also probably a bit of extra protection for the bits. The sewing on this roll is pretty straight forward, and here again, could possibly even be done by hand. There is only one layer of duck on all surfaces. The tie string is sewn into the hem and is made from a piece of cotton cording. 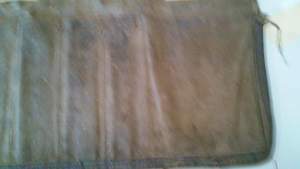 Here are a couple of pictures just to help you get a good idea of the Jelly roll. 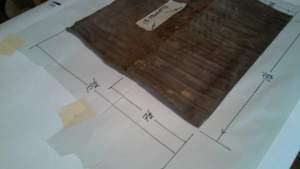 This gives you an idea of how the Jelly roll is put together. 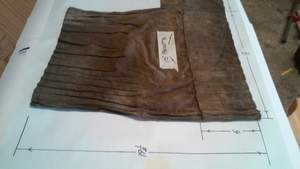 The flap, like I said extends to the right of the main body by 6 1/2 in. It is 8 1/2 high. Everything is simply hemmed to the inside of the roll. Here's how the flap goes together. This is another roll with fifteen (15) pockets. As I said before, this is probably a pretty good idea. In fact if you were making another roll with the standard 13 pockets, you might want to see if you could squeeze a couple more. It gives you a place to store a couple of extra bits or and expansion bit. I did notice also that there does not seem to be a hem at the top of the pockets. It might be wise to work this in however. Your roll is going to take a fair amount of abuse, so give the best chance for survival that you can. The tie string is just a piece of cording sewn into the outer hem joining the flap to the main body. I didn't measure how much up from the bottom, but it looks to be about 2/3 of the way up the 5 in pocket higth, or about 4 in. This makes sense if you consider that the main body is 19 1/2. You want the tie to wrap around roughly the middle of the bits. 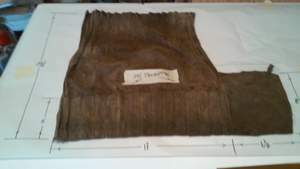 (Bits generally are about 8 to 9 in long) So allow a generous bit to the flap so it can cover the lower half and you have about 8 in......Half of that....4 in. Like I said, it makes sense. A look at the outer shell gives you a good idea of how the tie string is sewn in. Another example of elegant simplicity. It isn't a Swiss watch, but it should do what it was meant to do and do it for years to come! When I came across this roll while preparing this project, I considered not including it. If this had a face, only its mother would love it! Its rugged and probably protected tools rolled in it for decades. Whether it was commercially made or very well made in someone's shop, is difficult to say. The Beast deserves to be included only because someone may be looking for a general tool roll. 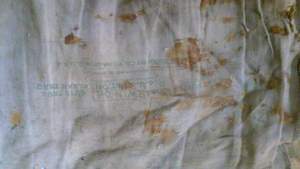 If you do decide to tackle a replica of this roll, you might want to employ the help of a tent maker....literally! I haven't seen canvas like this since I was in the Army. That might just be where this roll was made. In fact if you decide to copy this roll, you might want to check our your local Military surplus store for old samples of canvas. This shows the outside shell of the 'Beast'. This is another example of a simple one piece main body/flap design. There are only 10 pockets and they are a bit different than the other rolls. The left pocket is 3 in., the middle 8 pockets are 2 in. each and the right pocket is a whopping 6 in. Its obvious this was not just for drill bits. There is cording only around the outside of the roll. Finished base 26 1/2 in. Finished height 15 1/2 in. This gives you an idea of how the Beast roll is put together. Finished length 26 1/2 in. I've already commented about the general pocket layout. Even though the dimensions are a bit odd, they all go together much the same as the other rolls. The top edge of the pocket strip is not hemmed. As thick as the material is, I don't know if hemming heavy canvas would be necessary. There is also a rivet over each seam, about 1/2 in. down from the top. There is an even larger rivet centered on the bottom seam of the large 6 in. pocket. This gives you a better idea of how the rivets are placed. The general picture above shows the pocket layout pretty well. Here's a shot of the rivet on the bottom right hand pocket. There was no tie string. This is such a simple thing, you could probably put a tie string anywhere you want it. 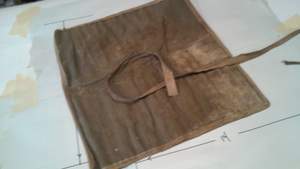 This is another roll the could benefit from a grommet and heavy boot lace for a tie string The Beast looks like you could modify it for almost anything you would like to contain. If you do make changes, keep in mind the layout so you can get a tight roll. You could put much more than auger bits in this thing.